One of my favorite things about this Google Chrome OS (aka CR-48) laptop is this website called LiveGO. Since the Google Chrome OS is a browser-based operating system, I won’t be able to load these separate programs like Windows Live Mail for my emails, AIM, Yahoo IM, MSN Messenger etc. I am so thankful for LiveGO because without it, I would have to load several websites just to check all my emails and see all of my buddy lists for chatting. One of the things I really wanted was to be able to Skype and unfortunately that feature is not available but I read that it will be coming soon as well as some other features like Todo lists, calendars, notes and a quick menu. The only thing that I really don’t care too much about is seeing Twitter on there because I like to look at lists. I want to see tweets in their list of importance to me like friends/family, celebs, true blood RPers, gays, mentions and direct messages. That’s where TweetDeck comes in which I don’t mind having in a different tab. And actually I keep my desktop on for TweetDeck then do everything else on the CR-48 laptop. I am really looking forward to LiveGO’s new additions because I really want to Skype with people, especially at Christmas time but since it’s only a week away I don’t see that happening so I guess it doesn’t really matter. 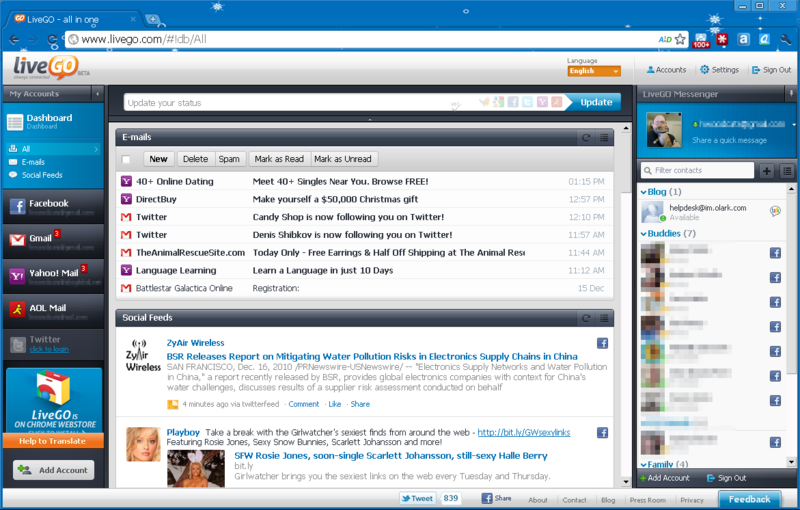 I have to show another screen shot of this LiveGO program showing some emails and my buddy list (everyone blurred out) as well as the dashboard. Notice how the buddy list on the right shows Google talk and Facebook buddies? It also shows my AIM and Yahoo IM buddies. I can’t connect with my MSN buddy list since I connect to Windows Live Messenger via my Gmail email address. I guess I should sign up for Hotmail so I can make it easier so I can see those buddies too. In the left you see all of my services that I have connected, Twitter is connected but signed out. It shows in my Gmail and Yahoo Mail the number of emails I have so I know if I have email. Then in the middle, on the top it shows my actual emails (in this case spam) and the bottom it shows my social feeds from Facebook. If I had Twitter signed in you would see that but I signed out because it scrolls so fast from all 2000 people I follow tweeting every second. So that is what I’m using now instead of many different websites and/or programs. I am all set to spend the next 6 months in Google Chrome heaven on my CR-48.